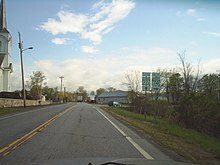 Shoreham /ˈʃɔːrəm/ is a town in Addison County, Vermont, United States. The population was 1,265 at the 2010 census. 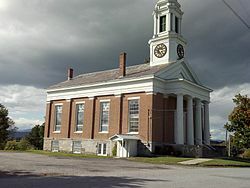 Shoreham is located in western Addison County along the shore of Lake Champlain. The western boundary of the town, which follows the center of the lake, is also the state border with New York. Neighboring Vermont towns are Bridport to the north, Cornwall and Whiting to the east, and Orwell to the south. Ticonderoga, New York, is to the west across Lake Champlain, accessible in the summertime by the Ticonderoga–Larrabees Point Ferry, a diesel-powered cable ferry. According to the United States Census Bureau, Shoreham has a total area of 46.4 square miles (120.1 km2), of which 43.4 square miles (112.5 km2) is land and 2.9 square miles (7.6 km2), or 6.36%, is water. The village of Shoreham is located at the intersection of Vermont Route 22A and Vermont Route 74. As of the census of 2000, there were 1,222 people, 453 households, and 342 families residing in the town. The population density was 28.1 people per square mile (10.8/km2). There were 556 housing units at an average density of 12.8 per square mile (4.9/km2). The racial makeup of the town was 98.53% White, 0.65% African American, 0.25% Native American, 0.33% Asian, and 0.25% from two or more races. Hispanic or Latino of any race were 0.49% of the population. There were 453 households out of which 36.2% had children under the age of 18 living with them, 64.7% were couples living together and joined in either marriage or civil union, 7.7% had a female householder with no husband present, and 24.3% were non-families. 18.1% of all households were made up of individuals and 6.0% had someone living alone who was 65 years of age or older. The average household size was 2.70 and the average family size was 3.08. In the town, the age distribution of the population shows 27.5% under the age of 18, 6.1% from 18 to 24, 28.2% from 25 to 44, 25.9% from 45 to 64, and 12.4% who were 65 years of age or older. The median age was 38 years. For every 100 females, there were 98.7 males. For every 100 females age 18 and over, there were 100.0 males. The median income for a household in the town was $39,375, and the median income for a family was $43,958. Males had a median income of $27,321 versus $21,912 for females. The per capita income for the town was $17,650. About 4.9% of families and 7.5% of the population were below the poverty line, including 7.8% of those under age 18 and 4.7% of those age 65 or over. Tourists can try apple picking at the Douglas Orchard & Cider Mill. They also sell strawberries and raspberries. They can also visit the Whistle Pig Farm where the famous rye whiskey Whistle Pig is hand-bottled. For dinner and drinks, Gastropub at the Shoreham Inn  is where tourists can interact with many of the town’s residents. Levi P. Morton, US congressman from New York and the 22nd Vice President of the U.S.
Thomas Rowley, poet known as "The Bard of the Green Mountains"
^ a b "Geographic Identifiers: 2010 Demographic Profile Data (G001): Shoreham town, Addison County, Vermont". U.S. Census Bureau, American Factfinder. Retrieved August 30, 2013. This page was last edited on 16 May 2018, at 13:41 (UTC).